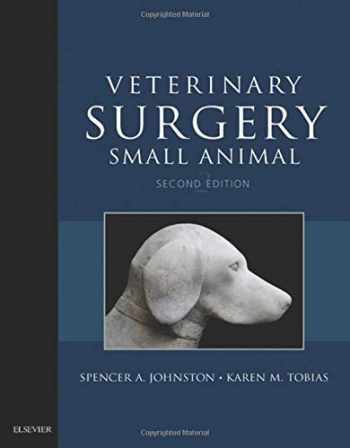 Acknowledged author Karen M. Tobias DVM MS DACVS wrote Veterinary Surgery: Small Animal Expert Consult: 2-Volume Set, 2e comprising 2600 pages back in 2017. Textbook and etextbook are published under ISBN 0323320651 and 9780323320658. Since then Veterinary Surgery: Small Animal Expert Consult: 2-Volume Set, 2e textbook received total rating of 4 stars and was available to sell back to BooksRun online for the top buyback price of $82.15 or rent at the marketplace. Focus on the "how" and "why" of medical/surgical conditions ― the critical issues that lead to successful outcomes for your patients ― with Veterinary Surgery: Small Animal, Second Edition. This two-volume full-color resource offers an authoritative, comprehensive review of disease processes, a thorough evaluation of basic clinical science information, and in-depth discussion of advanced surgeries. With an updated Expert Consult website you can access anytime and detailed coverage of surgical procedures, it is the definitive reference for surgical specialists, practicing veterinarians, and residents.Expert Consult website offers access to the entire text online, plus references linked to original abstracts on PubMed.Comprehensive coverage includes surgical biology, surgical methods and perioperative care, neurosurgery, and orthopedics in Volume One, and all soft tissue surgery organized by body system in Volume Two.Extensive references to published studies available on Expert Consult show the factual basis for the material.Strong blend of clinical and basic science information facilitates a clear understanding of clinical issues surrounding operative situations. Highly recognized contributing authors create chapters from their own experience and knowledge base, providing the most authoritative, current information available.Coverage of anatomy, physiology, and pathophysiology in chapters on specific organs includes information critical to operative procedures and patient management.In-depth chapters on anesthesia, surgical oncology, tumors of the spine, and musculoskeletal neoplasia provide valuable resources for practicing surgeons, especially in the area of cancer treatment. Preoperative considerations and surgical implications for surgical procedures help surgeons make decisions about treatment approaches.NEW and UPDATED! Expert Consult website with print text plus complete online access to the book’s contents, so you can use it anytime ― anywhere.EXPANDED! Coverage of interventional radiology techniques in Volume Two (soft tissue volume) to provide cutting-edge information on contemporary imaging modalities that gain access to different structures of the patient’s body for diagnostic and therapeutic reasons.NEW and UPDATED! Expanded coverage of coaptation devices and small animal prosthetics clearly explains how they are used in a variety of clinical situations. EXPANDED! Principles of minimally invasive plate treatment added to Volume One (orthopedic volume) to show how these advancements maximize healing and protect the patient while meeting the surgeon’s goals in using fracture fixation.